Researchers have found heavy metals leaking from unlined coal ash ponds near 21 power plants in five US states: Tennessee, Kentucky, Georgia, Virginia, and North Carolina. High levels of heavy metals, including arsenic and selenium, were found in surface waters or groundwater at all of the sites tested. Concentrations of trace elements in 29 percent of the surface water samples exceeded EPA standards for drinking water and aquatic life. The study, which appears in the journal Environmental Science and Technology, did not test drinking water wells, but that will be the next phase of the research, Vengosh says. Shallow wells—typically 30- to 50-feet deep—are not as deep as a drinking water well, which might be 100 to 300 feet. But there’s a potential the shallower contamination could flow deeper and affect drinking wells, Vengosh says. “The degree to which leakage affects the concentration of toxins in nearby waters varies because of several factors, including the nature of the coal ash, processes in the pond, and the flow through the local soil,” says Jennie Harkness, a PhD student at the Nicholas School and the lead author of this study. 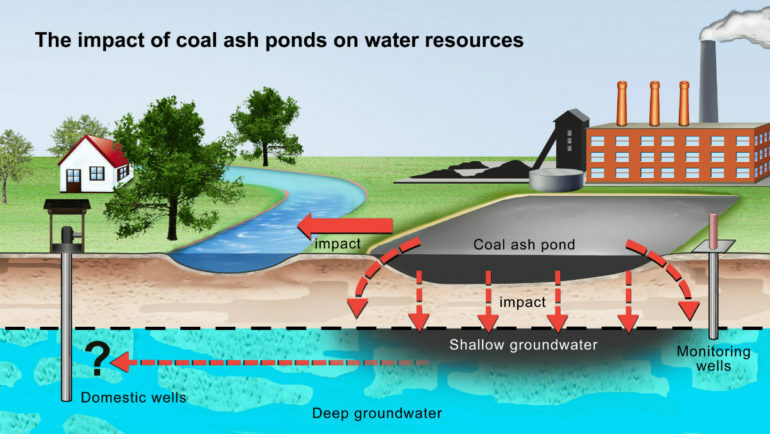 While it is legally permitted for some coal ash ponds to release liquid effluents to nearby surface waters through regulated outfalls, the new data show that these ponds are also leaking in unpermitted ways. The highest concentrations of dissolved metals and metalloids (manganese, vanadium, selenium, arsenic, and molybdenum) were found in shallow wells near a retired ash-disposal site in Tennessee. The contaminated groundwater there had concentrations exceeding drinking water and aquatic life standards for cadmium, iron, nickel, lead, selenium, and zinc. The Southern Environmental Law Center funded the study.